David Hollenberg is an assistant professor of Arabic and Islamic studies at the University of Oregon. He has authored articles on Ismailism and is the coeditor of The Yemeni Manuscript Tradition. Hollenberg is the founder of the Yemen Manuscripts Digitization Initiative, a collective of scholars and librarians devoted to preserving the manuscripts of Yemen. Ismailism, one of the three major branches of Shiism, is best known for ta’wil, an esoteric, allegorizing scriptural exegesis. Beyond the Qur’ān : Early Ismaili Ta’wil and the Secrets of the Prophets is the first book-length study of this interpretive genre. Analyzing sources composed by tenth-century Ismaili missionaries in light of social-science theories of cognition and sectarianism, David Hollenberg argues that the missionaries used ta’wil to instill in acolytes a set of symbolic patterns, forms, and "logics." This shared symbolic world bound the community together as it created a gulf between community members and those outside the movement. Hollenberg thus situates ta’wil socially, as an interpretive practice that sustained a community of believers. An important aspect of ta’wil is its unconventional objects of interpretation. Ismaili missionaries mixed Qur’ānic exegesis with interpretation of Torah, Gospels, Greek philosophy, and symbols such as the Christian Cross and Eucharist, as well as Jewish festivals. Previously scholars have speculated that this extra-Qur’ānic ta’wil was intended to convert Jews and Christians to Ismailism. Hollenberg, departing from this view, argues that such interpretations were, like Ismaili interpretations of the Qur’ān, intended for an Ismaili audience, many of whom converted to the movement from other branches of Shiism. Hollenberg argues that through exegesis of these unconventional sources, the missionaries demonstrated that their imam alone could strip the external husk from all manner of sources and show the initiates reality in its pure, unmediated form, an imaginal world to which they alone had access. They also fulfilled the promise that their imam would teach them the secrets behind all religions, a sign that the initial stage of the end of days had commenced. 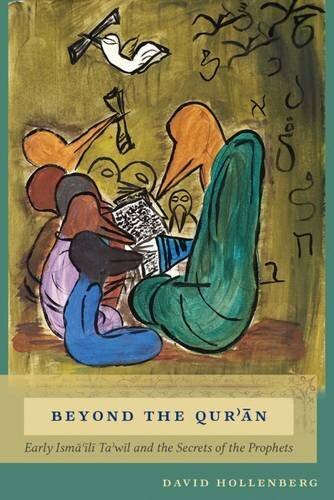 Beyond the Qur’ān contributes to our understanding of early Ismaili doctrine, Fatimid rhetoric, and, more broadly, the use of esoteric literatures in the history of religion.